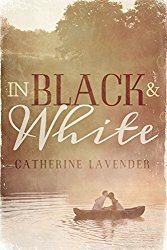 In Black & White, a novel by Catherine Lavender, is the story of Micah Winters, the daughter of a black mother, who raised her, and a white father, who was absent and nameless for the first five decades of Micah’s life. Only upon his death (and with her mother’s mind in the merciless clutches of Alzheimer’s Disease, does Micah learns her father’s identity: A famous and wealthy novelist and screenwriter named Sidney Irving, who leaves her a complex inheritance and more questions than answers – about her parents’ relationship and the circumstances the ended it, depriving her of a father. Note the reference to a white rose, which is an example of many instances of subtle references in the novel to the multi-faceted meanings of the black-and-white contrasts in our human lives, habitual social perspectives, and moral contexts. While the central theme of the novel is Micah’s exploration of her parents’ love and breakup in the context of race relations—public and private, past and present, painful and positive—the novel also explores the trials and tribulations of a middle-aged child caring for elderly parents, and the challenges of nursing home life—for the elderly and their loving children. The story also provides a fascinating journey of ‘rugs to riches’ with a twist: the riches come from a famous father who was never a father to her. In summary, this story of uncovering past sins, shocking truths, and touching kindness, rooted in American’s still troubled race tensions, provides a fascinating journey of discovery. Micah’s sensitivity, intelligence, and persistence lead her—and us—to a highly satisfying, yet intriguing resolution. This is a well-constructed novel, rich with human emotions, authentic conflicts, and genuine, real-life characters who will remain in readers’ minds for a long time. Highly recommended!